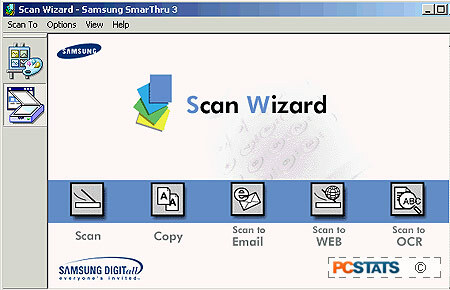 The SF-565P ships with Samsung's 'SmartThru' scanning software suite, which proved to be a valuable addition to the package. The Smartthru suite integrates all the scanning and copying functions of the printer into a single interface, including image editing and even an OCR (Optical Character Recognition) function provided by the AnyPage 2 OCR software. The resolution and printing options (for photocopying) can be controlled from the dialog box brought up for each option, though the settings are already optimized for each. 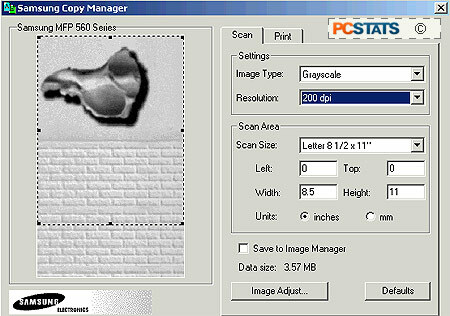 The OCR mode is extremely useful given the 20-sheet automatic document feed capabilities of the Samsung SF-565P. The basic OCR accessible from the SmartThru menu is excellent at character recognition of typical pages of text and basic tables, making few if any mistakes in our test documents. 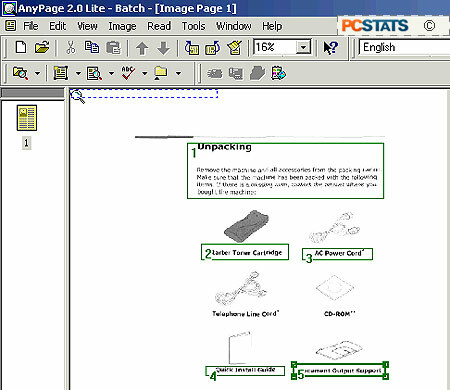 It has extreme trouble with non-standard layouts though, which is where using the actual AnyPage 2 software becomes essential. This full featured OCR software has little trouble converting the scanners output to an editable text file, and it makes a great companion to the SF-565P.